At 7AM I put the water stop container out on my front steps for Walt to pick up. At the time a moderately heavy rain was falling, the skies were dark and gray, and a wind was blowing. Walt, our long run meteorologist,Â had posted a weather update promising an end to the rain before our 8AM run but that prediction didn’t look promising, but having faith in Walt I left the house without a hat to block any precipitation and hoped for the best. Walt dropped his car off in Wakefield and made his way back with a 3 mile pre-run run back to Brueggers. In that time the rain stopped, the clouds cleared and our group was greeted with a bright sunny start at 8AM. â€œGone are the dark skies that had me blindâ€. Nice call Walt! As Walt made his way into downtown Melrose, seventeen more runners readied themselves for runs between 6.2 and 10.7 miles on the sidewalk outside Brueggers. Through the store front windows two little red-headed girls, Erin and Allison my next door neighbors, sent us off with smiles and waves. Along Main St towards Wakefield we went, Brian Slater and Judi leading the way, Brian Gilroy and I keeping close behind, with Walt, Ed, Eve (a new speedy addition to our group), Ginny, Nick, andÂ Sue Worrall on our heels. Peter, Jo-Ann, Mike Quigley, Nancy, Steve, Donna, Denyce, and Jen kept a solid pace down Main Street to round out the group. As we headed into Wakefield we got another smile and wave, this time from Sue Clough who was on her way to the water stop to join in for a few miles, making it an even 20 runners for the day. We pulled into the water stop, sweaty from the humidity and the heat from the sun but comfortable from a gentle cool breeze that was in our faces along the way. â€œLook straight ahead thereâ€™s nothing but blue skiesâ€. Judi headed over to the first â€˜red carâ€™ she saw and peered in for water stop supplies… not Walt’s car of course which Judi quickly pointed out is maroon, not red. The group rehydrated in the Dunkin Donuts auxillary parking lot. From there the long route runners continued down Main St to Lake Quannapowitt. The Brians led the group around the lake, matching each other step for step, both wondering how fast the other one actually is. Walt did his best to keep pace with them, a tough taskÂ having runÂ 3 extra miles than them, and planning on another three after they were done.Â Judi, along with Nancy and Sue Clough, is recovering from Friday night’s Blessing of the Fleet 10 Miler and took it easy on us today, looping the lake slightly in front of Ed and Eve. Ginny and I, after chatting at the water stop for a while, began our chase after them. With Sue Clough now part of the mix, Sue Worrall and Jo-Ann ran the lake with her to get in about 7.5 miles. Peter and Steve ran along with them as part ofÂ their 10.7 mile run. The rest of the crew turned around at the stop and headed back, or added on another mile by running up to the lake and back. After running most of the loop around the lake with Ginny I pulled ahead and caught sight of Ed and Eve. I tried to catch up as we followed the loop back to Main St and headed back to the water stop but a sore knee was hampering my pursuit of them. I kept them in my sights though and could see Judi slightly ahead… and saw Ginny pulling into the stop ahead of me. A moment of confusion, trying to figure out how she got ahead of me while I was giving quite an effort to catch Ed and Eve… then it dawned on me, she tookÂ the short cut along North Ave! At the water stop we took a quick accounting of who was where on the route to make sure no runner was left behind, and then headed out down Main Street to finish up our run. The lead pack took off quickly, again without dilly-dallying at the water stop. Ginny and I followed out but never caught sight of anyone ahead of us. As meÂ moved along my knee stopped hurting and I picked the pace up some. â€œI think I can make it now the pain is goneâ€. As we headed into the finish at Brueggerâ€™s we all spotted Walt heading back down Main St again in the opposite direction finishing up his 18 mile training run. Hey everyone, this week we take a step back from last week’s mileage and last week’s heat, and in the process let our bodiesÂ recover a little before pushing foreward again.Â At this point the forecast points to potential rain but cool temps. Up to Lake Quannapowitt and back for 10.7 miles for the long group and 6.2 for the not-as-long group.Â Walt will be handling the water stop so I think we’re all set there. I know a bunch of people headed to Rhode Island to run the Blessing of the Fleet so we won’t have our full crowd again this week. Let me know who’s in so we can plan to have enough gatorade and water this week (unlike last week). See you Sunday, 8AM, Brueggers! The special edition Saturday Morning Long Run left Brueggers shortly after 8AM. Jennifer and Linda led the charge down Main St to West Wyoming. In tow were Brian, Ed, two Sues (Worrall and Clough), Lois, Molly, Ginny, Steve, Matt, Peter, Kaj, and me.Â The pace started out somewhat easy, each runner trying to figure out what they had in them today, what theÂ weather had in store for them to day, and how to meter out the right amount of energy to last to the end of the run. Heading down Wyoming Beth joined in along the way, and as we turned onto The Fellsway East Jocelyn and her boyfriend mixed into the pack.Â Along the shaded hillsÂ of the Fells a gentle breeze blew which instigated thoughts that maybe this run wasn’t gonna be so hot. The long slight incline of Highland Ave was drenched in sun and absent of wind, giving us our first taste of the heat that would accompany us along the way. Pulling in to the first water stop, also drenched and abscent of wind, our pack of 17 runners went through almost all the water and Gatorade planned for two stops, keeping hydrated was in the forefront of each runners mind. Leaving the waterstopÂ eleven runners went left around Spot Pond,Â six runners right. Sue and Sue, Kaj, Beth, Jocelyn an her boyfriend headed right overÂ to Pond St and back Wyoming finishing runs from 4 to 7+ miles… plus a few early bird miles for Kaj. The rest of us circled the pond, the sun beating down, the temperature shooting up, and if that wasn’t bad enough we got to run past an unusually large, extra disgusting, pile of vomit on the side of the road. YUCK! Cutting through the parking lot no the Friendly’s side of the pond we took a brief break at the extra stop we set up to help combat the heat. Jen, Linda, and Brian had already set out to finish the loop back to Water Stop 1, with Ed along untilÂ he turned down Pond St for a 9 mile run. Molly, Ginny, and I were well behind them, Peter and Lois kept pace right behind us, while Matt and Steve trailed right behind them. The pockets of runners made there way past the Zoo where even the wolves were smart enough to just sit in the shade instead of running laps around their cage. Further along our route a group of walkers with their dogs settled under a tree to get out of the sun. It started to dawn on me, if this is too hot for dogs, what the heck are we doing out here! The only other creature more persistent than our group of runners were the Spot Pond gaggle of geese that wouldn’t budge of the sidewalk as we passed by with a momentary hop into the street. Sue Clough greeted us back at the water stop, having replenished the water and gatorade for us, providing us the nutrients we needed to complete our run… i we chose to. Along the last leg some took a ride back to Brueggers while others either walked or took a shortcut back via West Wyoming, or both. Those unwilling to give in to the heat (or not wanting to be referred to as a cheater in front of fellow runners) followed the prescribed route along the shaded Fellsway and out into the sun by the Melrose Middle School. The final stretch included temperatures in the 90s and a scorching sun as we turned up to Main St and back to Brueggers. The only highlight of that stretch was a short conversation with Mike York as he road along on his bike. I’ll just say Mike seemed a lot more comfortable biking than we did running. And that’s what we did, heading into Brueggers all red faced, sweat soaked, and surely stinky. It was even too hot to lounge out at “Bruegger’s Beach” so we headed into the A/C proud of the dedication and fortitude it took to complete the runs we all did today. This week’s training run will be held on Saturday, at 8AM, from Brueggers. We do this so people don’t use the excuse of the Sunday run to miss the MRC Summer Party Saturday Night or to use the excuse of the Summer Party to miss the Sunday Run. We’ll run Saturday morning, party Saturday night, and recover (from either the run, the party, or both) on Sunday morning. 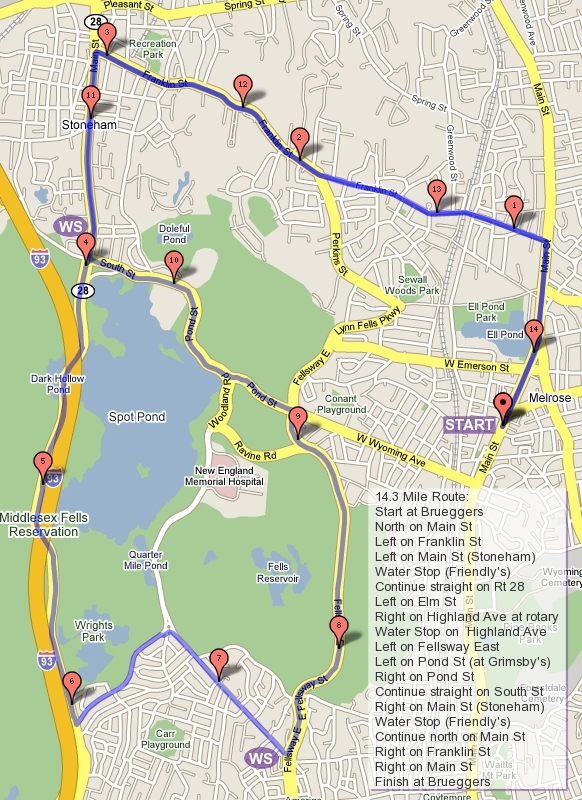 The route this week will be our first of many training runs to follow part of the old Melrose Half Marathon route. Take a peek at the map (see the link on the sidebar on the right of the blog for the maps) and know where you’re going. We’ll hit some hills on the way out the Fellsway East, circle Spot Pond clockwise, and return along the LynnFells. Half Marathon trainers will cut along the front side of the pond to Pond St. This loop is challenging and it will be a warm morning so I’m planning to have two water stops instead of the usual one. The first/third stop will be near the Mobil Station on Highland Ave, the second will be in the parking lot on the other side of Spot Pond near the other Mobil Station. Volunteers to help with the water stop. Peter mentioned not running but helping with the water stop. If he can meet us at Brueggers and handle the stop on Highland Ave, then I just need someone to pick me up in the morning on the South St side of the pond. Â So who’s in for the run? Please post here. This morning we started training for fall marathons and half marathons galore.Â Be itÂ throughÂ the vineyards of Brodeaux, France,Â or the shores of the Cape or Maine, or the mills of Lowell or ManchesterÂ today was the first step towards reaching the goal of running a marathon or half marathon. Eleven of us met up to begin our training. Walt, sweaty from his pre-run 6 miles took the lead with Barry, who didn’t plan on sweating due to a lack of fluid in his body caused by tipping back a few the night before. These two pulled away from the rest of us as we headed up Main St to the LynnFells. With a wind at our back so we couldn’t feel it, a hot morning sun beating down on us, and humidity in the air we made our way to Main St in Saugus. Work related talk filled the air as everyone caught up with the current events of what we all do when we aren’t running. Ginny, Molly, Evan chatted ahead of Lois and I, while Kaj and Beth Ford talked behind us, and Matt and Steve Hamilton behind them. Evan and Beth took Howard St back to Melrose for a 4.2 mile run while the rest followed through the hills to Farm St… all except Barry who went straight on to Breakheart and looped around to get a few extra milesÂ in and still catch back up with theÂ group.Â As we approached the water stop Liz beeped and waived on her way to meet us for the final 4 miles. Walt was the first one to hit the water stop at Wakefield HS.Â In his fervor to get at the much neededÂ Gatorade and water in my trunk, Walt openedÂ the front door and feverishly pulled every lever he could find: hood, gas tank, maybe evenÂ reclined a seat orÂ two andÂ pulled on the emergency brake beforeÂ finally finding theÂ trunk release…Â Â this is when he discovered that the latch for my hood is rusty and the hood, once open,Â doesn’t close completely without the help of a screwdriver. With many apologies Walt headed out as the rest of us replenished our fluids. While I drank I stuck my head under the hood to try to fix it and by the time I was done the rest of the crew had snuck away with a head startÂ to Water St. The second half of the run felt much different than the first with a strong headwind cooling us down. As we made our way over to Main St in Wakefield and back towards Melrose there were some MRC sightings along the way.Â Brian Gilroy was spotted in a car near the Omlette place in Wakefield, Rick Collette was seen at an ATM taking out his entry fee money for the Khoury’s Summer Steamer held this morning, and Dan Slattery was found getting in a run of his own along Main St. The cool breeze kept the pace strong past Greenwood and Franklin, by the LynnFells and Ell Pond, and back to Brueggers.Â All theÂ runners streamed into the finish one by one in good form, each looking ready for the voyage to our autumn goals.